Many of the authors writing about theology after the Reformation have raised resounding criticisms of “traditional” or conservative Christianity. The modernist philosophers David Hume (in his Dialogues), Immanuel Kant, Friedrich Schleiermacher, Martin Kähler, and Rudolf Bultmann have all taken issue with conservative Christianity. I will argue that these authors share a common criticism of the authority structure implicit in “conservative” theology alongside their own individual criticism—though these all relate to their common criticism. Many of those who have written about theology since the time of the Enlightenment are considered theologians of Modernism, they write to various extents from a modernist worldview. The one tenet of this Modern or Enlightenment worldview that they all share is that of the autonomy of man—the independence of human reason. When David Hume wrote his Dialogues Concerning Natural Religion, he destroyed natural religion by a scathing criticism of the idea of analogy. His attack on natural religion and, more broadly, theism was successful because of the ground he had already won in his work on miracles. Hume had argued that even if God exists, he does not break into the world—that there is no such thing as a miracle. It is impossible, reasoned Hume, to ever be sure that the testimony of a supernatural experience corresponds to something that actually happened, for by definition this is an unusual experience and we have never had such an experience—we cannot trace the idea back to any sense impressions we have had. For Hume, and the other Modern writers, a God who speaks is God who demands submission, who limits the bounds of human reason: conservatism was a leap back to premodernism, a retreat to a place of irrationality. Hume therefore excluded God from the realm of human thought: if God exists, this fact can make no difference on human life. Though later thinkers were more optimistic about the possibility of God, they never rejected the right of man to autonomous thinking. Kant produced a complex Philosophical system that excluded a-priori, without any consideration of God or miracles, the possibility of God revealing himself. He could then reinterpret Scripture however he wished. Schleiermacher did the same thing to defend religion to his friends. For Schleiermacher, Scripture only testifies to a religious experience: it does not communicate true statements. For Kähler, human reason had eliminated the possibility of God speaking objectively—inerrantly—through Scripture, so the ground of faith must be the overall impression of Christ we receive in reading Scripture. Barth took a similar stance: the Word of God is the not the fallible production of man we have before us in the Bible but the event that happens as we read it—God encountering us in an ineffable way. For Bultmann, the Biblical worldview contradicted the modernist one, and therefore must be false: Scripture then needs to be demythologized, stripped of offensive bits to reveal the kernel of existential truth concealed within. Each of these authors accepts the modernist presupposition of human autonomy and rules out from the start the possibility that God could speak through Scripture and command the intellectual submission of man. From this presupposition, each author drew their own respective critiques of conservatism. For example, Martin Kähler argued that the problem with conservatism was the insistence upon an inerrant Scripture. Modern thought had shown the Bible to have errors, he reasoned, so we cannot fall back uncritically on premodern thinking. 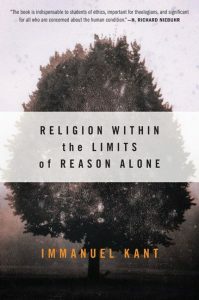 For Schleiermacher and Kant, it was the problem of universality; Christianity claimed to be an exclusive religion, to be the only true religion, because of historical events. That is, it makes a universal claim on the basis of particular circumstances—the events of 33 AD are determinative for all human existence. This was offensive: Kant accepted Lessing’s ditch, no historical particular could have universal rational significance. Schleiermacher rejected the exclusiveness of the Christian religion: all people have access to religious feeling; each religion is only a reflection upon this basic religious experience. The way each of these authors overcame the problems of conservatism was to reject its key tenant of a God who has spoken authoritatively in History through the Bible. They each built their ideas of religion on the basis of human reason alone: the Bible was to be interpreted by their respective canons (e.g., Schleiermacher’s religious feeling). By rejecting a God who speaks, they all rejected a God who says no to human autonomy, a God who can declared invalid our most lofty wisdom. It appears to me that these authors saw some rightful errors in the conservative theologies of their time, but they never thought to counter conservatives on their own ground. That is, if conservatism presupposes the authority of the Bible, then it can be corrected by an appeal to the Bible. All these authors rejected this possibility: they did not consider the possibility that a claim of inerrancy does not demand the exhaustive verification of every detail (contra Kähler), that historical particularity can have universal significance (contra Kant), that their might be one true religion in world rebelling against its creator (contra Schleiermacher), and that the Bible’s own worldview might be normative.